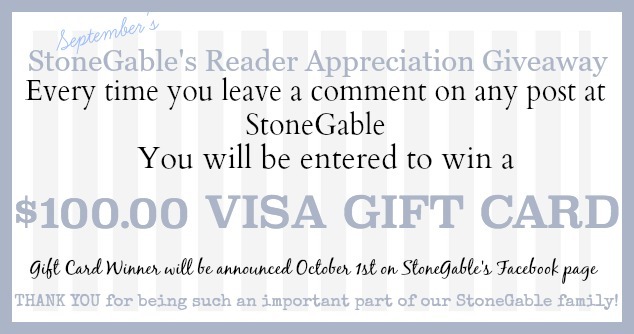 Fall is in all its glory here at StoneGable! But that does not mean changing my regular home decor or lugging big boxes up and down my basement stairs or even moving too much around. This year I’m adding fall to my already existing decor, mostly tucking the season into my home. It’s such an easy way to decorate and looks amazing too! 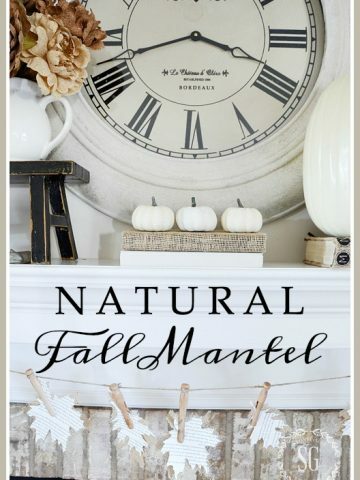 Gone are the days ( I remember so well) when fall decor looked like it was brought in by the truckloads and dumped in our homes! The open shelves in my breakfast nook are getting their fall on! 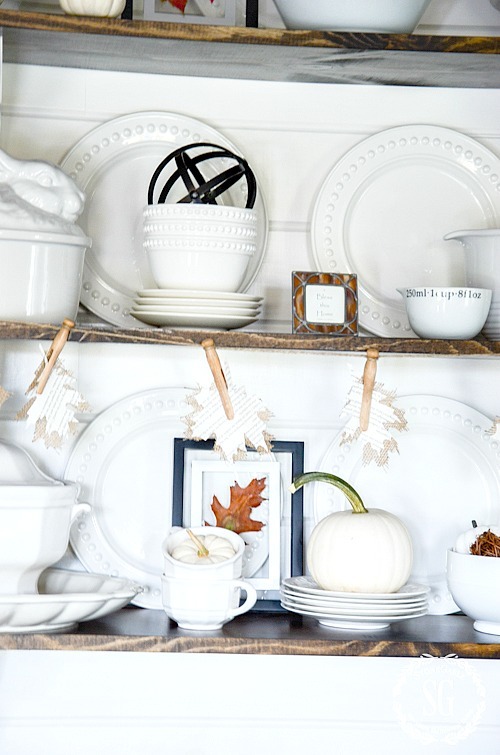 White dishes with a tiny spark of vibrant autumn orange is one of my favorite ways to decorate. Easy, understated and perfect for fall! Today I’m joining other bloggers with a FARMHOUSE bent for…FARMHOUSE! You will want to stop by these very talented bloggers sites and soak in all the fall farmhouse inspiration! Links at the bottom of this post. Just like the mantel in the family room, I hung a burlap and book page garland across the open shelves too! I am a little overly infatuated with leaves this year in all their interpretations! You can see this easy-to-make garland, HERE. I’ve tucked little leaves cut from old book pages here and there in my fall decor. To brighten up the white dishes and give them a little fall appeal I added framed leaves. This is such an easy DIY. You can see it HERE. White baby boo pumpkins are my absolute favorite fall element! I think they are just adorable. Our Amish farm markets have them now! So you will see them dotting my fall decor again this year! So adorable! I’ve not only white pumpkins but a few sweet, plump orange and white pumpkins too. They are showing up around StoneGable! I call these “one pound pumpkins” because that’s what they often weigh. 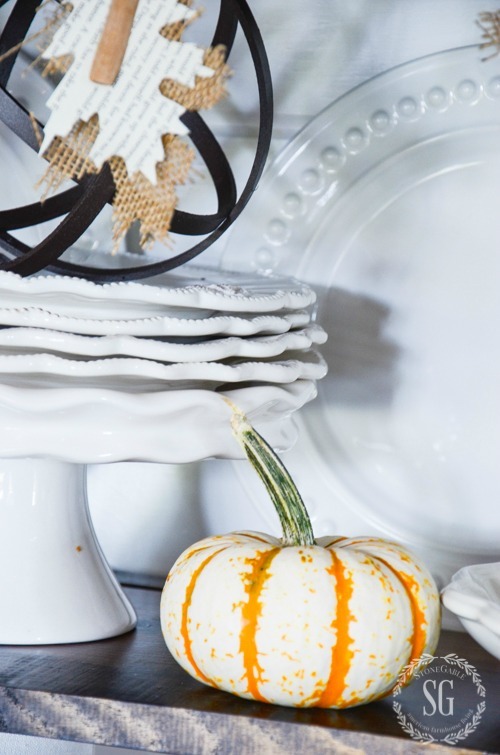 Isn’t this white pumpkin so cute perched on a stack of plates? Did you notice that I mix real and faux pumpkins together? The open shelves are ready for fall! 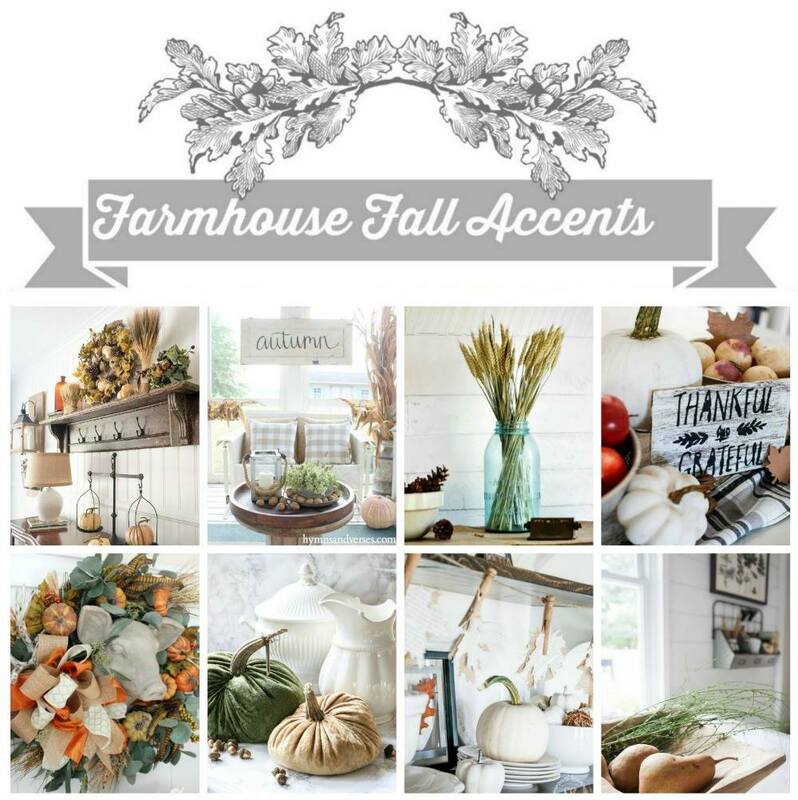 Make sure you check out all the fall farmhouse inspiration…. 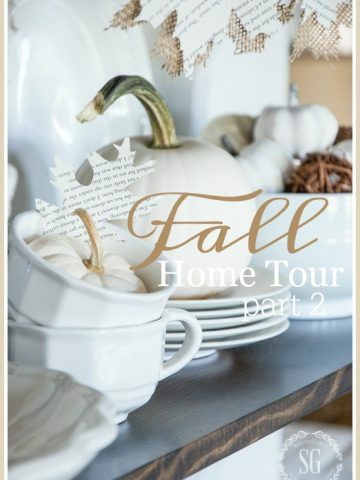 This week it is also the ECLECTICALLY VINTAGE FALL HOME TOURS SPONSORED BY GOOD HOUSEKEEPING! 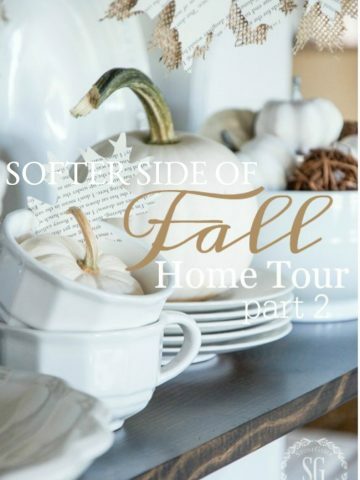 You can visit gorgeous homes ready for fall all week. As always, your shelves are beautiful! I love the white pumpkins, and the baby ones are my favorite to! Rena, the length is the size you need. The height between the each shelf is 15 inches. Tall enough to stand a plate upright. I hope this helps. Simple and elegant touches, so effective! So charming! I love white dishes! Love how light and airy it looks, while at the same time screams fall! I love your white slip covers on your upholstered furniture, can you tell me where I can possibly get the same to cover my tired couch love seat and chair? I love the look of them in your home. Please let me know where to get them so I can change the look of my furniture and be able to pull off to wash. Thanks for all the great inspiration! You did it again, Yvonne! 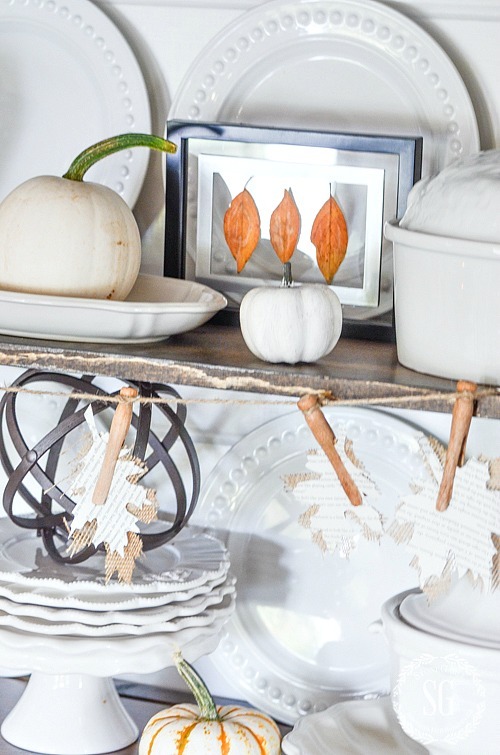 You are the queen of decorating, those little book page and burlap leaves melt my heart. I love getting to do this blog hop with you. I have jumped on the transition to whites and neutrals – your ideas are just super and I’m “stylin'” to copy!! You’ve awakened a “not so creative” part of me & hopefully, I’ll be a little more creative this fall! Loved you ideas. Many thanks for your “permission “and inspiration to make Fall happen so easily and simply! Love, love the book leaves garland! I have to make the baby corn wreath! I have an art studio where I do my mixed media art projects and it will be just perfect for the door with the rustic siding and front porch filled with mums. Can’t wait to shop for the small ears of corn! I love the open shelves! 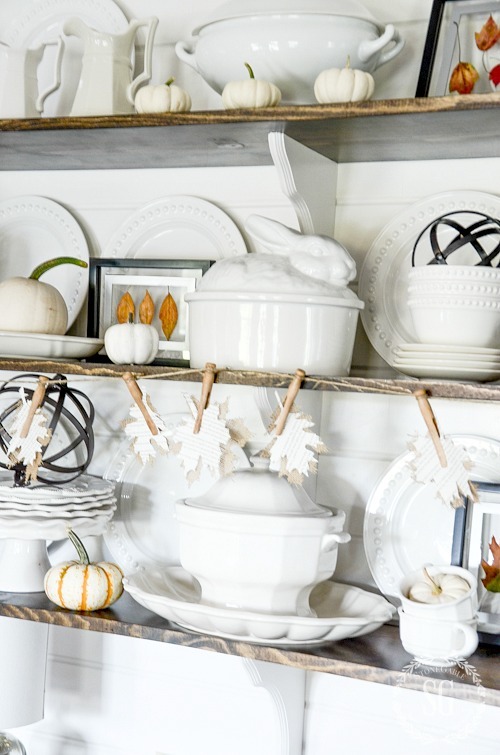 The white ironstone and white pumpkins are so elegant! I always think of color and more color in the fall but this is just stunning. Love everything you do on here! Those little baby pumpkins–the white ones and the white and orange striped ones–are so darn cute! I gotta get out and look for some. I love the understated Fall decor in your house. The white dishes with just the barest amount of orange accents are so lovely. Understatement is so elegant, I think. Thanks for showing your Fall decor. I’ll look forward to the next posts to see more. I’m a Seasonal Decor Tucker. I keep my main stuff out all year, just tuckng in leaves, little doodads among my regular items. Only real changes I make are linens, candles(not holders)flowers(not vases). So much saner way (w health issues) to handle the decor changes. lovely white! very nice decor! Loving your Fall decor, and loving that decorating seasonally doesn’t need to mean lugging container after container out of storage. I just may be inspired to get out my Christmas stuff and pare down in time to share the overflow with others before the Christmas Season begins. Love your open shelves. Where do you get those darling little orbs? Just home from Paris and catching up on all my favorite bloggers. Your burlap and book pages leave garland is just gorgeous. I love the neutral look with the white baby boo-boos and pinned your post about how to make the garland onto the Pinterest group board, DIY Rockstars. I am inspired to create some fall leaves of my own… with my own twist that includes a little French, of course. I love your little touches and I’m looking forward to seeing the book leaves tucked in your decor. I have to run out for groceries, but I will be reading all of the article links for the other bloggers. Very simple and nice. I can identify with lugging in tons of decorations. I’ve always loved to decorate for the seasons but DO NOT enjoy putting it all back. HA! I thought, we use our basic clothing wardrobe and by adding accessories we create fashion statements – it’s the same concept with out homes. 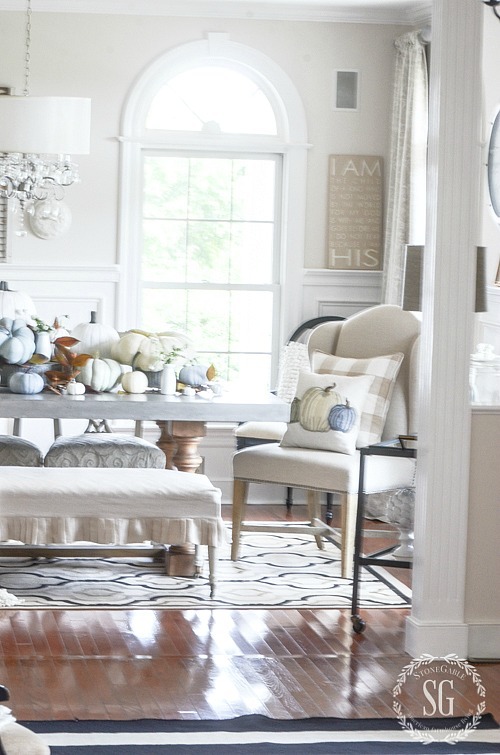 Keeping our basic decor items in place, but adding seasonal accents to freshen and add interest to specific areas of our homes is a lot less work and the end results is just as spectacular. Looking forward to the fall tour. Love the tuck ins. Love all of your beautiful fall ideas! Can’t wait to see the rest of your fall home tour. A ritual at our house when the smaller grandkids come over is a “walk about” with Memommy. We walk the neighborhood collecting whatever catches their eye and fancy. A staple, of course, are seasonal flowers and leaves. Your delightful framed leaves has inspired me to turn our next “walk about” into a take-home project! Your open shelving looks amazing! Thank you for the inspiration. White is simply beautiful! I love all of your dishes, white pumpkins, and touches of orange. Love the little pumpkins and that leaf garland . As usual, your house looks fabulous, and I look forward to seeing the full fall tour this week! 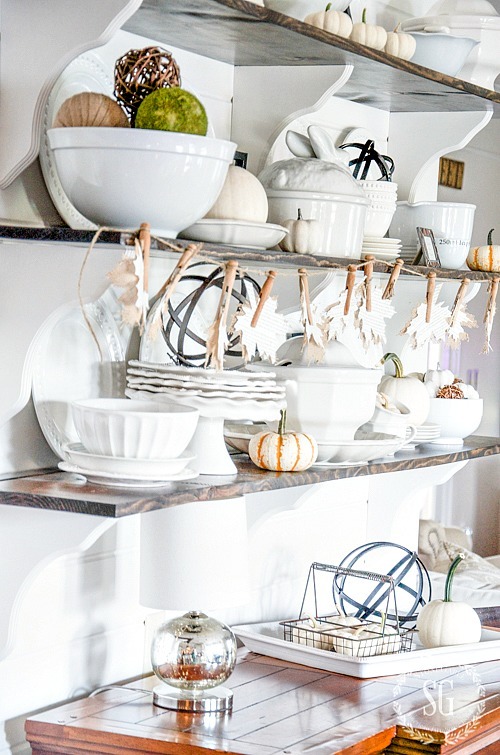 I love your open shelf kitchen, only made prettier with your mini pumpkins. In the past I was able to purchase “cheese leaves”, they were beauriful. They actually were used to sit partially under a cheese wedge for serving. I have not been able to find them for purchase for years. I can look at your beautiful photo’s and decor for hours! Makes me want to rip everything done and re-do it all! hahah As always, thank you for the inspiration! Beautiful shelves! I’ve emulated a lot of what you’ve done by tucking both white and orange small pumpkins in and around my white dishes. I made my own chalk painted pumpkins for the first time this year, too, thanks to your inspiration, Yvonne. You’re such a fabulous teacher! Love Fall decorating, but like you, I’m tired of lugging boxes up and down the attic steps! That is too hard on this woman’s knees! I’ve been placing a few Fall touches here and there. Trying to achieve a more subtle look this year. Simple is beautiful and classy. 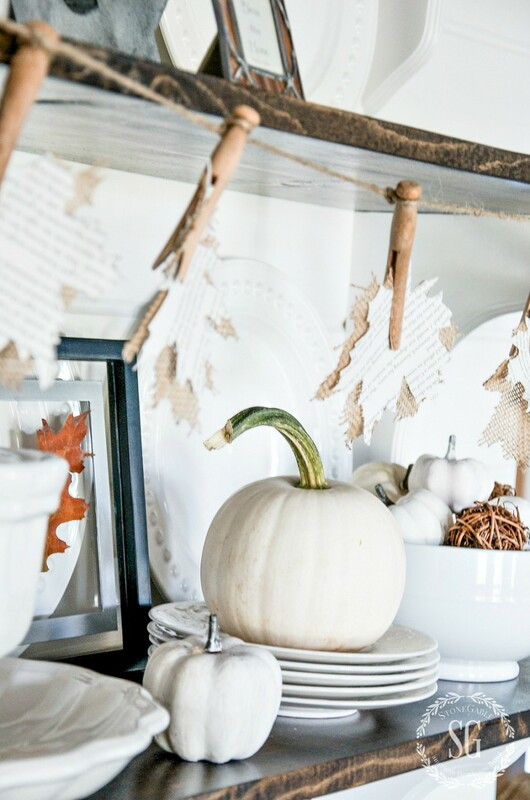 I love the white pumpkins and have added to my fall décor. Your ideas are right on. Beautiful shelves! I would love to visit an Amish farm stand. Would be interesting to learn about their lifestyle! Do they have shops where they sell handmade items? What fun! 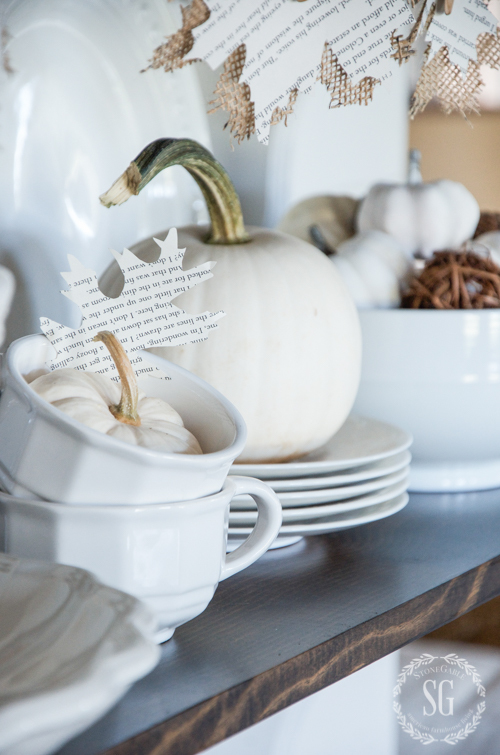 Time to decorate for fall…Thanks for the inspiration! Love this. I confess; the leaf truck used to leave piles of leaves in my home! Several years back, I fell in love with white pumpkins and have used them as my fall decorating theme. Thank you for some lovely new ideas.. The idea of little touches of Fall here and there is refreshing and so much easier to accomplish. I love it! Thanks for sharing your ideas! Love your style! I like that you don’t disrupt your regular decor, you just add some fall to it! Just love your fall decorating. Better still, I love all your home decorating. You are so talented. I forgot to ask: when you use real pumpkins to decorate, do you treat them with anything to keep them from rotting? If so what do you treat them with? I so love the white dishes with the touch of orange! You have a beautiful home! Most of the fall items I have are orange, this year I am adding more white pumpkins! I love your little white pumpkins! Loving all the white! The little Baby Boo pumpkins are the perfect touch of Fall! Hoping to get up to your area later this month to soak in all that is fall! And to visit my alma mater and the outlets (of course)! Love the bunny tureen! your shelves are beautiful- a white palette is so fresh and crisp, very soothing! I love the light touches of fall Yvonne! So beautiful! I love those baby boo pumpkins, too. Can’t get enough of them! I like the simple touches of Fall decorating. The paper leaf garland is something I especially like, so easy to make with my die cut machine.the simpler, he better ! Simple and sweet. I remember the ” overload” holiday decorating. Simplicity wins out every time with me. 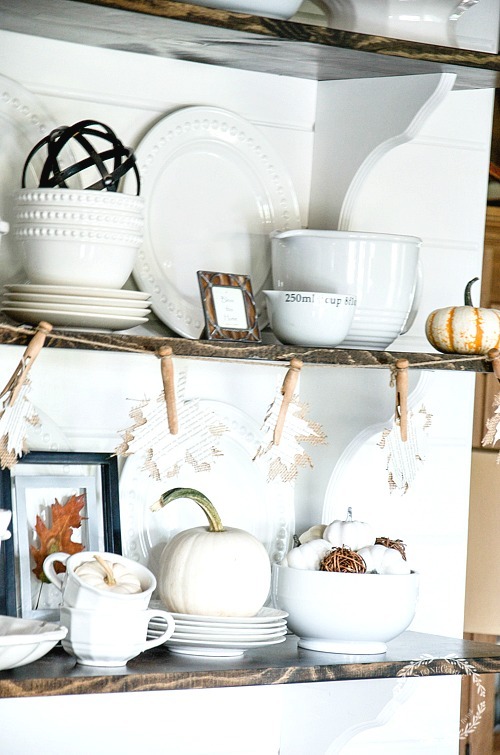 Love the changes and additions you’ve made for fall to your farmhouse open shelving! 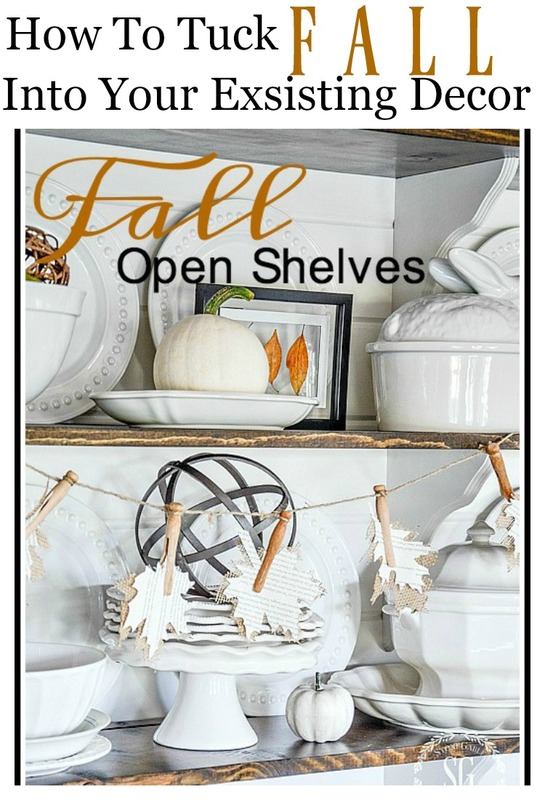 I always enjoy seeing how you decorate the open shelving for the different seasons. Happy Fall! Great ideas. I notices that you make wonderful use of all your dyi projects. 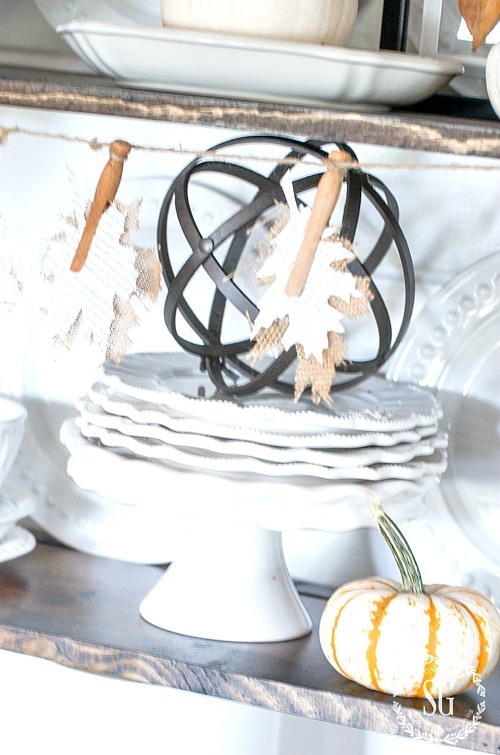 I addition to the garland and floating framed leaves, I spied your wonderful orb project, too. Everything looks amazing styled on your shelves. Beautiful! I hope to follow your lead……soft, light,simple….no pumpkin explosions!! Beautiful shelves and love that garland, I really do want to try my hand at making them using your tutorial, thanks for all of your wonderful inspiration. Hi Yvonne , you’ve inspired me this morning to haul one of my big plastic totes out of storage- for the last time! I’m going to sort thru my fall decorations and pick out just a few select items to decorate with and the rest ( and there is a lot if it!!) will be donated . I used to do the same as you with the bins every decorating season and i realize i’m ready to simplify too! I spent yesterday decorating for fall, and your posts inspire me greatly! I chalk painted dollar store pumpkins, and they look great! I copied your ribbons on them, and they are adorable! I don’t have open shelves, but will have “bits of Fall” tucked in everywhere else! Thanks for all of your ideas! Everything in your home is beautiful. I am doing open shelves in my kitchen as soon as the painting is done. Just the right amount of Fall with those wonderful white dishes. So pretty, Yvonne! I love how fresh it all looks, I love the white baby boo pumpkins! I’m going to see if I can find some of those where I live. It may be a while before they come out, but I will look for them. I can find the orange ones though. Our local church in the town I live in has a huge pumpkin patch with all kinds of pumpkins. I can’t wait! I’m going to begin decorating September 30th. It’s on my calendar, and I even take a day off from work to start decorating. I look forward to that all summer long. In the meantime, keep up the inspiration because I am certainly enjoying it! You’re the best! Always beautiful and inspiring, that’s why we all love u so much!! I’m glad to see pumpkins coming out earlier this year. Last year I moved into my new renovated home on November 6th and just filled it full of pumpkin everything so when September hit this year I just pulled out what I had and added some fall apple décor items. 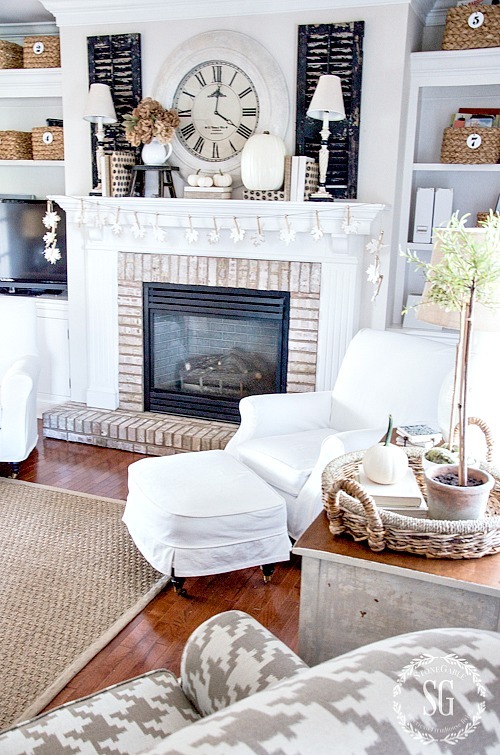 I think I will try the burlap/old book leaf garland on the front of my dining room built-ins. Thank you as always for such wonderful inspiration!! Very pretty. But to me the joy of fall is the colors. I prefer to use them. I’m ready for fall. Thanks Yvonne for your fantastic ideas! Great job as always. Fall is definitely in the air at your house. Gorgeous, Now I have some ideas to try and repeat at my house. Yvonne, your shelves look gorgeous! I love all the beautiful Fall touches. I have been decorating for Fall this past weekend. I love to decorate for Fall! I hope that you have a Happy Monday!!! Love the leaf garland, so simple and economical. 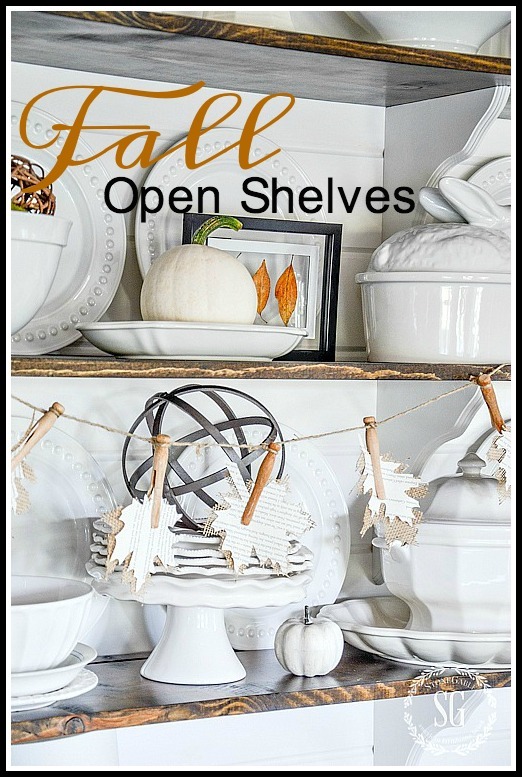 I love the subtle touches of fall peeking at us from your open shelves. And the idea of just tucking in little hints of the season is perfect. The thought of hauling a tote or two up from the basement and changing things out …. well, that is just not happening! Thanks again for some great inspiration with my early morning coffee! Perfect! Simplify …….I love all of the white dishes with the touch of orange! I am morphing this burlap book leaf idea into a bookmark for my book discussion group. Thank you for the great idea. Yvonne, it is simply beautiful! Of course I adore the book page leaves. White pumpkins have not made it down here yet, so I am a little jealous! So light, bright, and beautiful!! 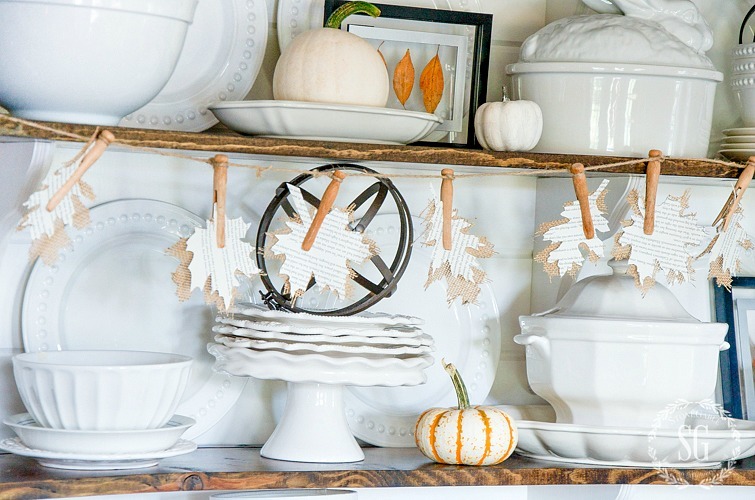 Love the leaf garland and those clothes pins!!! Stunning Yvonne! I just love your home all your touches. 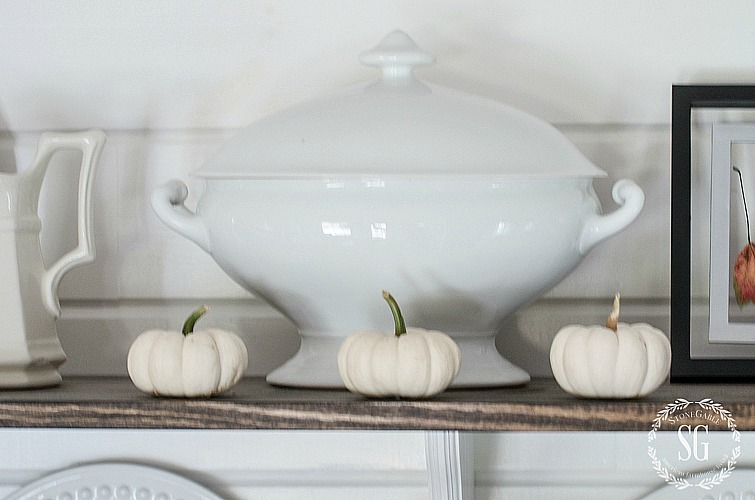 White plates, and white pumpkins is such a perfect combo! Simply beautiful as always, my friend! Love your garland and every single thing. I love open shelves and have them in my kitchen, but the book page leaves you added are adorable! Your home is lovely, Yvonne! Beautiful shelves – you are the most talented lady in blogland!! Well, bless your sweet heart Anne Marie. You are my new best friend!